Andrew Chilombo, Eric Tambo and Justus Masa joined the Symposium on "State-of-the-art: Challenges and trends in Energy and Water in Africa" which was organized by the Pan-African University institute for Water and Energy Sciences (including Climate Change) PAUWES in conjugation with the United Nations University – Institute for Environment and Human Security (UNU-EHS). The Symposium was the first event to be held by PAUWES as part of its objective of establishing a community of practice in the sector of water and energy sciences. The three fellows shared their expertise on different subjects related to the area. Andrew Chilombo, who is an environmental specialist at the Global Environment Facility (GEF) at the World Bank Group, supports national governments in Africa and other developing regions in the world to, among other, improve institutions and policies that underpin good governance of their natural resources. His presentation at the symposium focused on the importance of good governance, appropriate institutions and tailored policies. It also offered possibilities to introduce the AGGN. Justus Masa was invited due to his expertise in field of energy storage, specifically in electrochemical energy conversion and storage featuring advanced batteries, electrolyzers and fuel cells for from domestic to Grid-level storage and conversion capacities. He gave a presentation on renewable energy technologies, and also chaired one of the sessions on "Energy Policies, Governance and Institutional Capacity Building”. 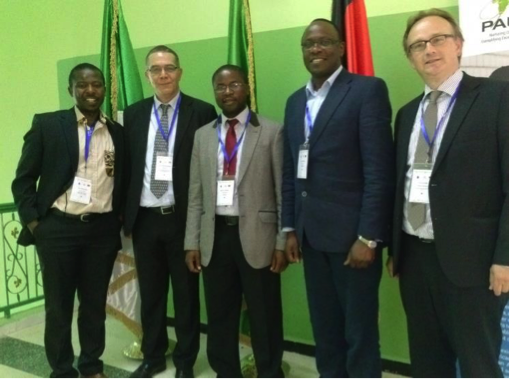 The PAUWES is supported by German development cooperation and is partnering with institutions such as the DAAD, ITT (Institute for Technology and Resources Management in the Tropics and Subtropics) at the University of Köln, ZEF (Center for Development Research) at the University of Bonn and GIZ. Representatives of these institutions also attended the symposium which gave abundant chances to network.